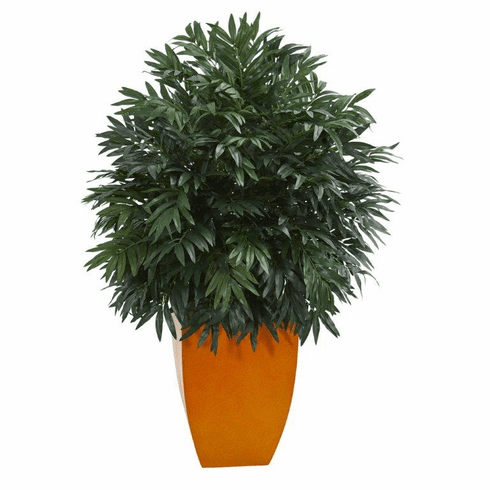 The palm artificial plants densely clustered green leaves give it a bold and striking appearance. Large in size, the foliage slightly drapes over the included orange square planter. The eye-popping color of the planter makes it perfect for a retro-inspired room when included with other equally colorful ornaments and furniture, like a red or turquoise rug, chair, or vintage shelf. Height: 4 Ft., Width: 22 In., Depth: 22 In., Color: , Pot Size: H: 15.5 In. W: 11.25 In. D: 11.25 In.